Solid axles with leaf springs were used front and rear and drum brakes at back, operated by cables, were specified. Alloys wheels were a novelty, as was the hollow front axle for reduced undersprung weight. A second feature of the type 35 that was to become a Bugatti trademark was passing the springs though the front axle rather than simply U-bolting them together as was done on their earlier cars. A less expensive version of the type 35 appeared in May 1925. The factory’s type 35A name was ignored by the public, who nicknamed it “Tecla” after a famous maker of imitation jewelry. The Tecla’s engine used plain bearings, smaller valves and coil ignition like the type 30. While this decreased maintenance requirements it also reduced output. 139 of the type 35A were sold. The engine was lowered for a better center of gravity and the frame was lightened with a number of holes drilled in the chassis. The signature piano wire wheels used splines between the brake drum and run and relied on the radial spokes to handle cornering loads. 250 hp (186 kw) was on tap and 8 were made. As a teenager, Louis Chiron fell in love with cars and racing. He learned to drive at a young age and joined the Grand Prix circuit after World War I where he had requisitioned from the artillery section to serve as a chauffeur. Competing in France, in 1926 he won his first local race, taking the Grand Prix de Comminges at Saint Gardens near the city of Toulouse. From there, Chiron went on to drive a Bugatti and an Alfa Romeo P3 to important wins in the Marseille Grand Prix, the circuit of Masanyk, and the Spanish Grand Prix. In addition, he teamed up with champion marathon driver Luigi Chinetti to win the 1933 Spa 24 endurance race in Belgium. 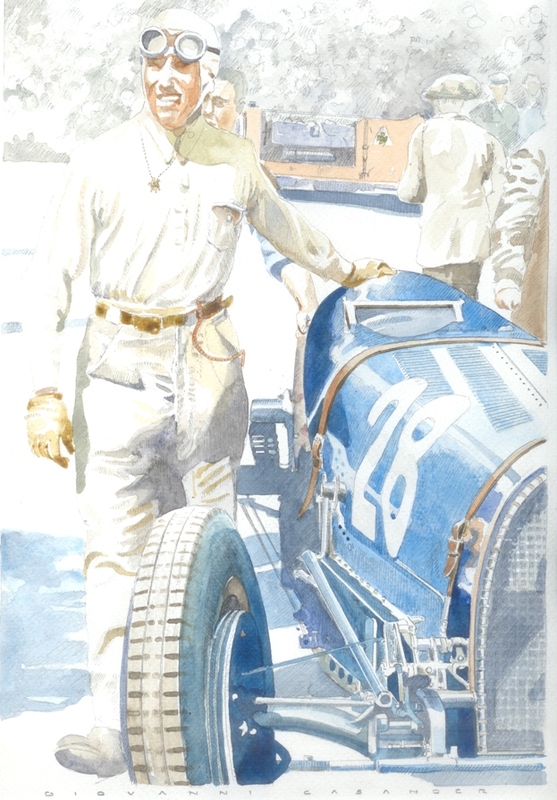 He also drove a Delage to 7th place in the 1929 Indianapolis 500. He won the 1931 Monaco Grand Prix and as of 2012 he is the only Monaco born driver to have done so. Louis Chiron’s career came to an end with his retirement in 1938 and autoracing itself a year later with the outbreak of World War II. When racing resumed after the War, Chiron made a comeback and drove a Talbot-Lago to victory in two French Grand Prix races. At 1924 French Grand Prix he took an early leaving the rest of the GP elite far behind only to retire near the finish with a broken car. When Fiat closed the race department halfway through 1924 the lure of big prize money saw Bordino back in America again and racing from December through to May 1925, finishing his American adventure with a disappointing 10th place at Indianapolis. In 1927 Fiat returned to racing for the last time at the Grand Prix di Milano and Bordino drove the new car to a stunning victory against the best drivers in the world. Seven months later, on April 15, 1928 Bordino, now driving for Bugatti in a T35C, hit a dog during practice for the Targa Florio. The impact jammed his steering, the car crashed into a river and the greatest driver of his time, was thrown from the car and unconsious or badly injured, he drowned. He was only 40 years old. Tazio Nuvolari started out in motorcycle racing in 1920 at the age of 27. In 1925 he captured the 350 cc European Championship. From then until the end of 1930, he competed both in motorcycle racing and in automobile racing. For 1931, he decided to concentrate fully on racing cars and agreed to race for Alfa Romeo’s factory team : Alfa Corse. In 1932 he took two wins and a second place in the three European Championship Grand Prix, winning him the title. He won other Grand Prix including a second Targa Florio and the Monaco Grand Prix. After Alfa Romeo officially left Grand Prix racing, Nuvolari stayed on with Scuderia Ferrari who ran the Alfa Romeo cars semi-officially. During 1933, Nuvolari left the team for Maserati after becoming frustrated with the Alfa Romeo’s performance. At the end of 1934, Maserati pulled out of Grand Prix racing and Nuvolari returned to Ferrari, who were reluctant to take him back, but were persuaded by Mussolini, the Italian minister. The relationship with Ferrari turned sour during 1937 and Nuvolari raced an Auto Union as on-off in the Swiss Grand Prix that year before agreeing to race for them for the 1938 season. The only major European Grand Prix he never won was the Czechoslovakian Grand Prix. Upon his return to racing after the war, he was 54 and suffering from ill health. His final race, in 1950 saw him finish first in class and fifth overall. He died in 1953 from a stroke. Bugatti type 18. 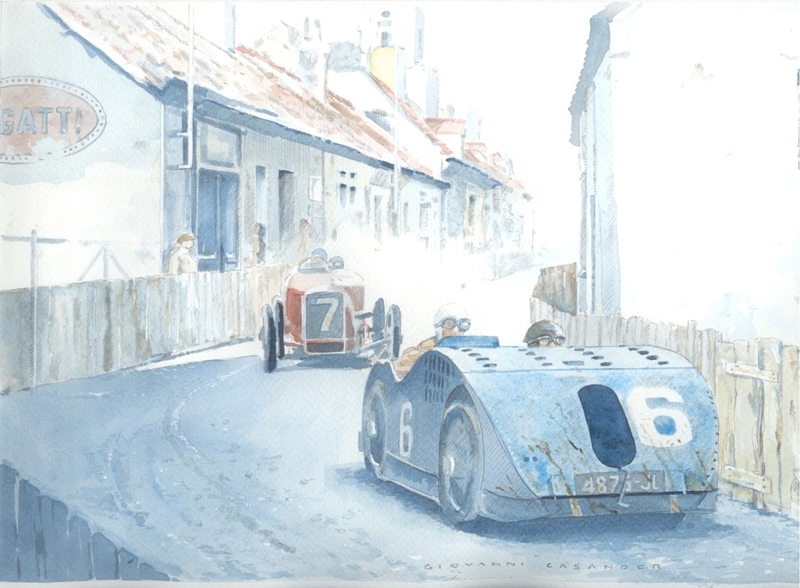 It was raced by Ettoire Bugatti himself on the Mont Ventoux and at Le Mans. Compared to the other Bugatti’s of the era, it has an unusually large engine and uses chain to drive the rear wheels. 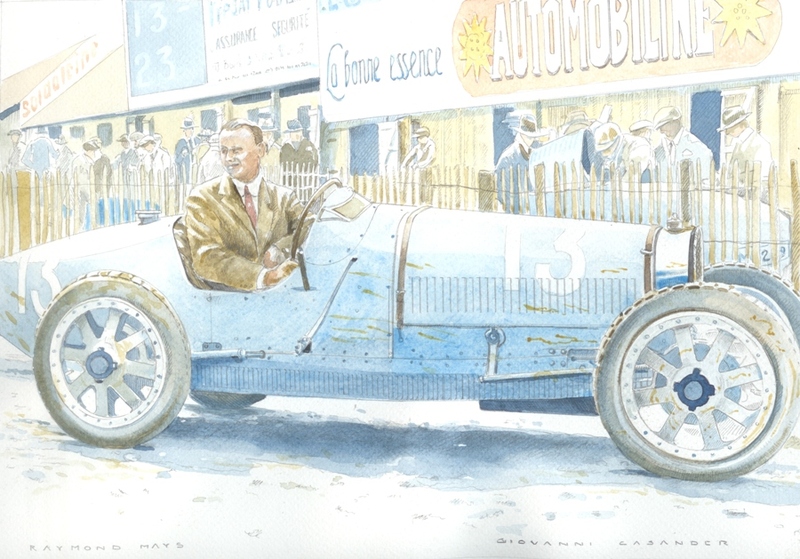 Mays raced for some thirty years, competing in various cars : two 1.5 litre Bugatti’s, Mercedes, Invicta’s, Riley’s and ERA’s. In 1929 he broke the hill record at Shelsey Walsh. Mays was one of ERA’s most notable drivers, winning the British Hill climb championship in its first two years, 1947 and 1948 and also the Brighton Speed Trials in 1946, 1947, 1948 and 1950 in his black ERA R4D. He stopped driving racingcars at the end of the 1950 season. Most road cars used an 8 valve engine though five type 13 racers had 16 valve heads, one of the first ever produced. 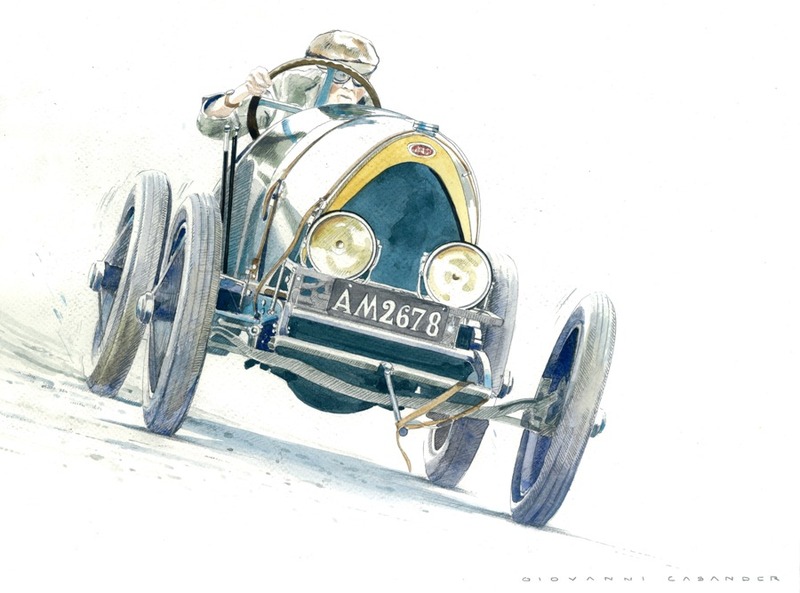 The new company produced five examples in 1910 and entered the French Grand Prix at Le Mans in 1911. The tiny Bugatti looked out of place at the race but calmly took second place after seven hours of racing. 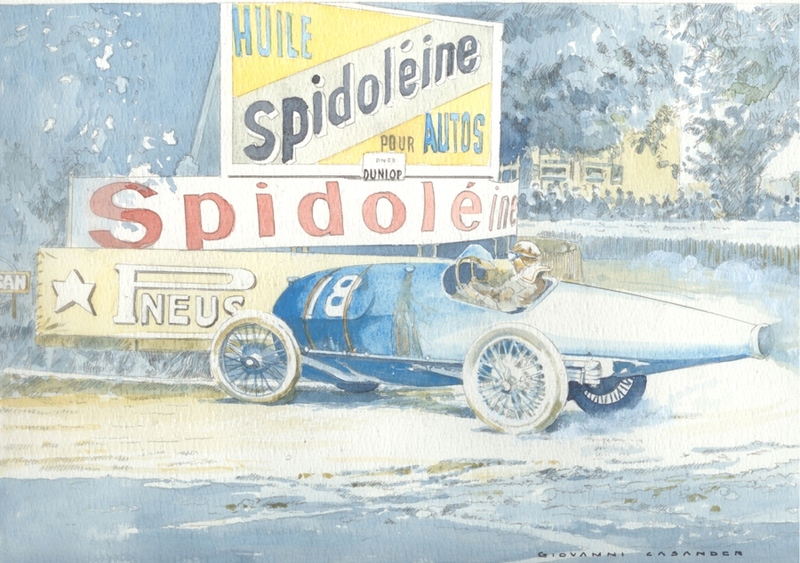 A Grand Prix for Voiturettes at Le Mans was the only French event of 1920 and Bugatti entered the two completed cars from Milan and one more from the remaining parts. Ettoire’s illegal act of placing a hand on the radiatorcap during the race brought disqualification to the leading car however. The type 13 was unbeatable. 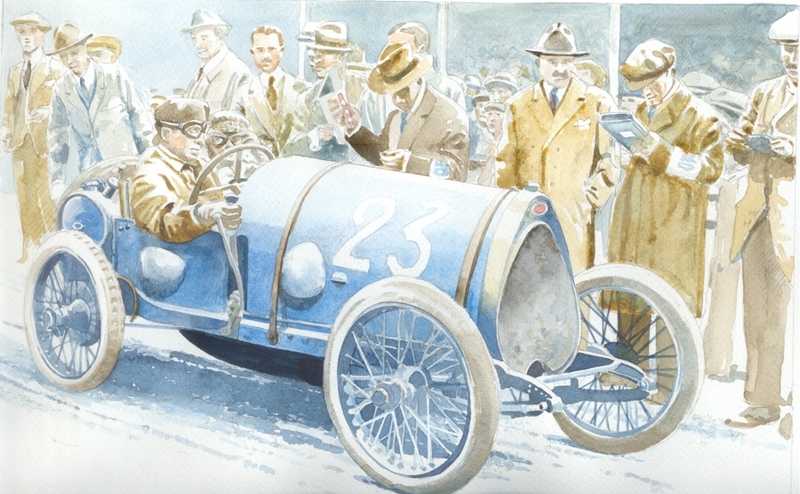 Bugatti’s cars places 1, 2, 3 and 4 at the Brescia Grand Prix in 1921. 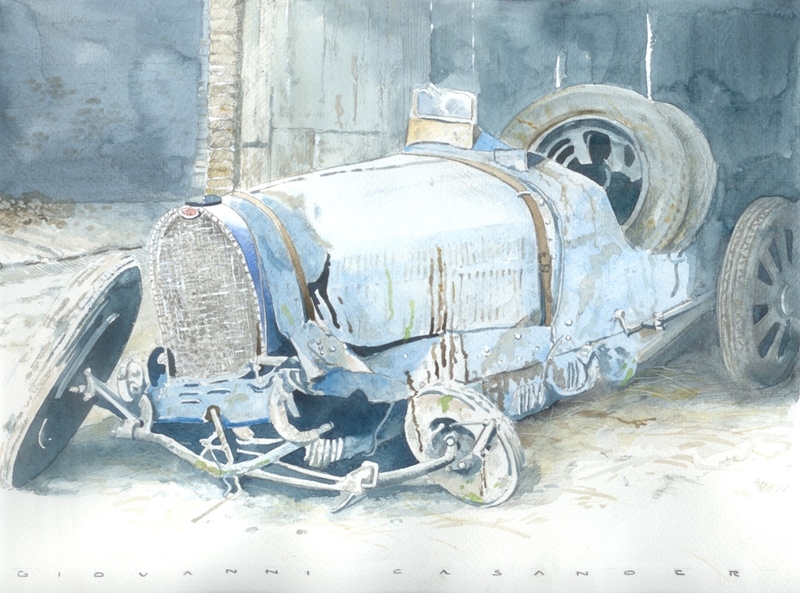 Bugatti type 32 Tank finished third in the Grand Prix that year. This was the first Bugatti to be fitted with roller-bearing big ends in order to improve the bottom-end reability (Bugatti was rather late than most manufacturers in the incorporation of a fully pressurised oilsystem, preferring a splash “spit and hope” delivery method). The type 32 also broke new ground (for a racing bug) by using a three-speed and reverse transaxle unit, the exceptionally short wheelbase and long straight 8 engine making a conventional gearbox difficult to accommodate. It also heralded an hydraulic front brake actuation. Another tank-bodied Bugatti racer the 1936 type 57G was much more successful. Only two cars have survived. The course was on public roads over a distance of 13,3 km and 60 laps. Ettoire Bugatti was a French manufacturer of high-performance automobiles founded in 1909 in Molsheim, Alsace by Italian-born Ettoire Bugatti. Bugatti cars were well-known for their design, beauty and for the large number of races that they have won. The death of Ettoire Bugatti in 1947 proved to be the end for the marque and the death of his son Jean Buatti in 1939 ensured there was not a successor to lead the factory. No more than about 8000 cars were made. The company struggled financially and released one last model in the 1950s, before eventually being purchased for its airplane parts business in the 1960s. In the 1990s an Italian entrepreneur revived it as a builder of limited production exclusive sportcars. Today the name is owned by German automobile manufacturing group Volkswagen.